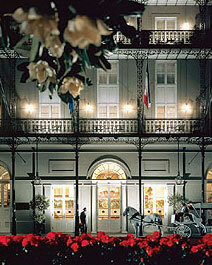 A haunted hotel in New Orleans, the Omni Royal Orleans is also comfortable and well-appointed. The previous owners are said to haunt the Omni Royal Orleans, another haunted French Quarter hotel. Employees say that these ghosts watch over the guests and play occasional pranks on visitors who say something out of line about the knick knacks at the haunted hotel. A maid from the 18th century sometimes gets guest rooms ready for bedtime, turning on the bath, or the lights, or flushing the toilets in the middle of the night. Some speculate that there are more than four dozen ghosts at this haunted hotel in New Orleans. The building where the Omni Royal is now located was once the site of the New Orleans slave market. This was where slaves were bought and sold. Often, the slaves were maltreated. New Orleans paranormal investigators have captured photographic evidence of the Omni’s earthbound entities.